This statistic shows the total value of all imports in Scotland from 2000 to 2017. The value of imports increased over this period. In 2017, the value of imports to Scotland amounted to approximately 95.7 billion British pounds. As stated in an analysis of Scotland's import partners, the country's largest import trading partner is the European Union (EU). 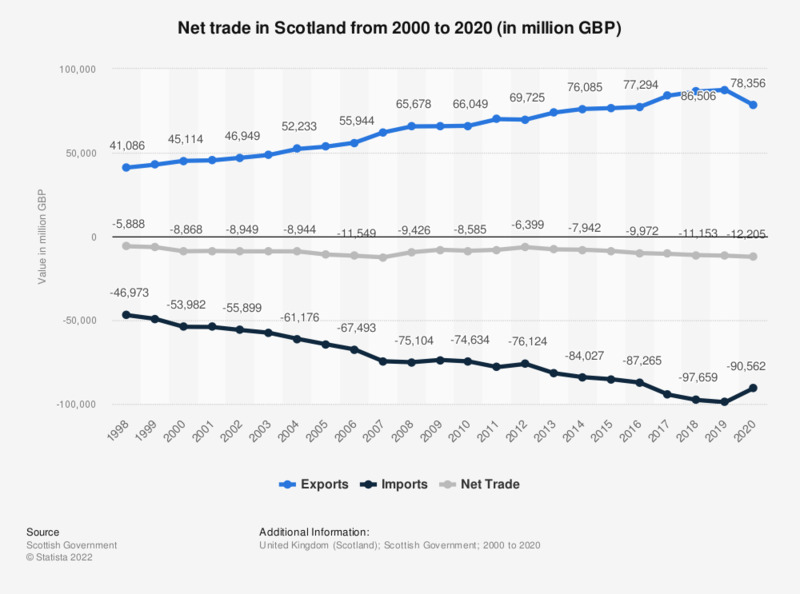 According to the value of net trade in Scotland the country imports more than it exports, a substantial amount of which is imported from trade with the rest of the UK. Click on the following link for further information regarding the value of Scottish imports from the rest of the world. The values of imports in Scotland by Standard International Trade Classification (SITC) sections are also available, Click on the following links for more information with reference to imports of: food and live animals, beverages and tobacco, crude materials, mineral fuels, animal and vegetable oils, chemicals, manufactured goods, machinery and transport.